– Preassembled locking security hood speeds up assembly and ensures all products will be secure. – Secure cabinet doors keep cleaning supplies concealed from view and locked up when carts are unattended. – Mop bucket platform with securing grooves keeps WaveBrake® or microfiber charging buckets securely attached to cart. – Durable 8″ ball bearing wheels and quiet 4″ casters make maneuverability easy and quiet for workers. 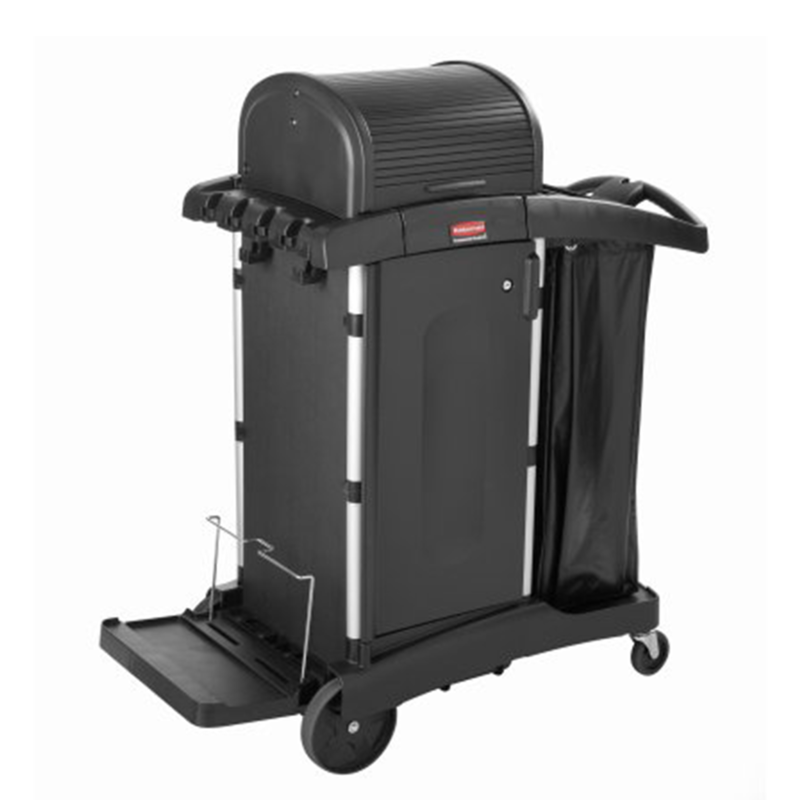 – Interchangeable handles and removable platform allow user to easily expand or reduce the footprint of the cart to meet specific cleaning and storage needs. – Rubber tool grips and hooks securely hold up to 5 stick goods, while hooks hold up to 4 safety signs. – Expansive storage space with optional bins and caddies let staff restock before they clean, increasing productivity by eliminating search time for additional supplies. Add additional bins, caddies, and pails (FG9T8400BLA, FG9T8200BLA, 1857378, and 1857391). – Compact size fits great in space-constrained areas; with a high capacity-to-footprint ratio, only 22″ wide. – Joint Commission-Compliant to meet Environment of Care Standard 3.10.3 with locking doors and hood. – Perfect for healthcare facilities. With a stylish sturdy design, the Platinum Janitors Cart is a delight to manoeuvre. With the flexibility to hang multiple accessories it includes many clever design features, like handle & rear platforms that fold for easy storage.